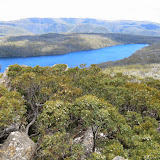 Although a minor peak at 1228 metres the peak directly above Lake Fenton is only 46 metres below Field East and 20 metres higher than both nearby Seagers and Davis Lookouts but is unnamed, so I have called it Fenton Peak. The idea was to walk there to view the scoparia in the very attractive setting at the saddle before Windy Moor and I described it as a stroll. First we went through the most pleasant bush to Seagers Lookout where we met three women, one who knew me and one recognised Adrian; as is often said “Tasmania is a small place”. From there we went on the aforementioned saddle where we discovered the scoparia was not as brilliant as previous years then a fairly scrub free ascent to the Fenton Peak. From there it was much scrubbier than I remembered to descend to the valley of the Davis River. Adrian did say that he was going to write to Websters Dictionary and ask that the definition of “stroll” be amended. Return was through more scrub down to the Lake Fenton track. Whilst going down we came upon a rocky area with both Pencil and King Billy pines although none were particularly large. The elevation profile below gives the appearance of a big climb, but there is only 200 metres difference from low to high. An album of photos is on the web, click the image below.